UNITED NATIONS, Sep 11 2012 (IPS) - World Water Week recently concluded in Stockholm with a special emphasis on the linkages between water and food security. From the worst drought in 56 years in the United States Midwest, to the Karnataka’s drought in India, to the protracted drought in the Sahel region of West Africa, we have also seen how in our globalised world the nexus between lack of water and food security in one corner of the world affects us all. The impact of the drought in the Midwest has resulted in higher prices for corn and soybeans. In the Sahel, 18.7 million people are facing food insecurity. These events are a stark reminder of how the environmental dimension has direct economic and social consequences. They remind us of the critical inter-linkages between the economic, social and environmental dimensions of development and of how water availability, affordability and quality are related to food security. Women and girls are at the centre of this connection. In many countries, women carry out most tasks related to water – they walk long hours to fetch water, they cook, they clean, they care for the sick and the elderly, and they grow food for their families and communities. Yet, women’s participation in decision-making on water and food management is low and they are not sufficiently prioritised in water policies, programmes and infrastructure. Women hold less than six percent of all ministerial positions in the field of environment, natural resources and energy and they are underrepresented at lower levels as well. The 2012 progress report on the Millennium Development Goal points out that, while the MDG target on water has been largely met, 783 million people still remain without access to an improved source of drinking water. Women are disproportionately affected, which increases their burden and reduces their time for other activities, such as going to school or earning an income. Globally, it is estimated that women spend more than 200 million hours per day collecting water. In Sub-Saharan Africa, 71 percent of the water collection burden falls on women and girls. This reduces their opportunities for education, decent work, political engagement, and perpetuates the intergenerational transfer of poverty and disempowerment. While women dominate subsistence agriculture and unpaid water collection tasks, men dominate cash crops. Current estimates show that 70 percent of the world’s water is needed for agriculture, 20 percent for industry, and 10 percent for household use. In many countries, women’s strategies for lifting themselves and their families out of poverty take place in the household, where the share of global water usage is already low. Even in the agricultural sector, women depend more on non-irrigated and rainfed agriculture. In addition, water rights are often related to land rights, which precludes women smallholder farmers from accessing irrigated water. Entitlement systems constitute another barrier with women and girls having unequal access to productive resources, such as water, land, fertiliser, finance and credit, and technology, often due to gender norms and stereotypes. If women were to have equal access to agricultural services, including irrigation services, agricultural yields would increase by an estimated 15 to 20 percent, reducing the number of hungry people by 100 to 150 million. First, women need to be recognised as water managers, farmers and irrigators, who contribute to ensuring sustainable food production and consumption and to safeguarding the environment. This must be done in laws, policies and through social awareness programmes in communities. Secondly, governments and other partners need to ensure that women are empowered along the water and food supply chain, so that their food production and water management roles are supported. Improvements in infrastructure services— especially water and electricity—can help free up women’s time spent on domestic and care work. In Pakistan, putting water sources closer to the home was associated with increased time allocated to productive market work. In Tanzania, girls’ school attendance was 15 percent higher for girls from homes located 15 minutes or less from a water source than in homes one hour or more away. Water supply must cover the needs of the poorest by initiating reforms that make water affordable. The poorest, the majority of whom are women, have less access to safe drinking water and pay more for their water usage. Thirdly, we need to address the multifaceted gender discriminations in accessing and controlling productive resources. Women must be provided with technical training on water management, irrigation, rainwater harvesting, and rain-fed agriculture. In South Africa, Lesotho and Uganda, women ministers for water are taking affirmative action to train women for water and sanitation related careers, including science and engineering. At the local level, women have been trained to locate water sources in the village, decide on the location of facilities, and repair pumps. Fourthly, women must be recognised as decision-makers in water governance. This involves reducing membership fees and broadening the mandate of irrigation schemes to acknowledge and include multiple water users. In summary, an “ecosystem of policies” must be created – an enabling environment with strong institutions, targeted programmes, capacity-building, functioning systems and sectoral policies. Women’s agency can be built through supporting women’s organizations, self-help groups and women’s cooperatives. Equitable water security needs to be a public policy priority. This is a message not only to governments, but also to development partners and donors so that they prioritise it in their aid allocations. We need to catalyse alliance, knowledge sharing, commitment, innovations, actions and financing to address the nexus between food security and water from a gender perspective. The Rio+20 Conference set the basis for a strong international normative framework in this area. Gender equality and women’s empowerment, water security and sustainable water management, and food security and agricultural development were all identified as priorities for a sustainable future. The connection between these priorities, so clearly made in the Rio+20 outcome, must be carried forward. As we approach the deadline for the achievement of the Millennium Development Goals, a new set of goals will be launched – the Sustainable Development Goals. The three priorities of gender equality and women’s empowerment, water, and food security must be strongly interlinked in the goals that will cover these areas. The Sustainable Development Goal on water must have clear targets and indicators capturing the gender dimension. It must be reflected with targets and indicators on women’s full participation in water governance, the alleviation of their work burden, and the availability of gender-sensitive infrastructures and services. Women and girls are thirsty for available, accessible and affordable clean and safe water. We can no longer ruin their potential to become inspiring leaders, successful entrepreneurs or healthy mothers due to their heavy burden of fetching water. As we move towards the 2013 international year for water cooperation, we need to catalyse alliance, knowledge sharing, commitment, innovations, actions and financing to address issues related to affordability, accessibility and availability of safe and sufficient water for all at all levels. UN Women will be a strong advocate for leveraging women’s voice and influence in water governance. Gender equality and women’s empowerment must be the part of the blue revolution and green revolution that we seek to launch. 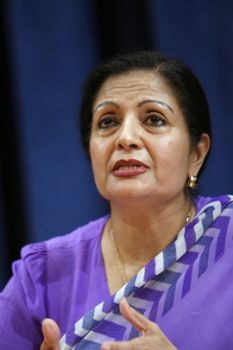 *Lakshmi Puri is the assistant secretary-general and deputy executive director of UN Women.